If you are hiring more than 50 people per year, you can benefit in a big way from using text analysis software for your job descriptions. You can see the company below has a better total score (61.88/100 versus the industry average of 55.36) but has room for improvement on Gender Bias and Readability. Gender Scores — It gives you a % of words that are masculine versus feminine-coded (e.g. the 70.83% below). 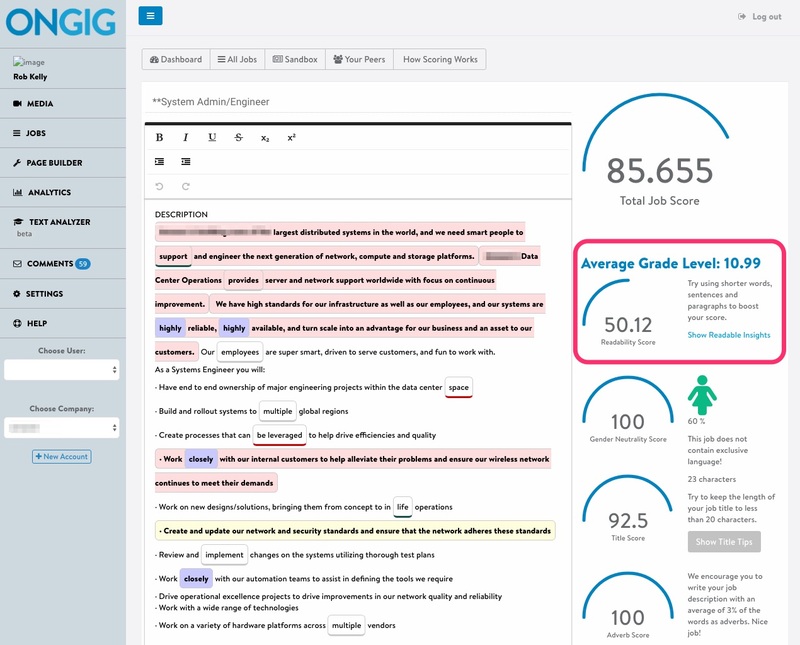 Note: Ongig’s Text Analyzer below also gives a score out of 100 (e.g. the 58.34 Gender Neutrality Score is a separate score that increases closer to 100 as your JD gets more gender-neutral). Most job descriptions use sentences that are longer than necessary. 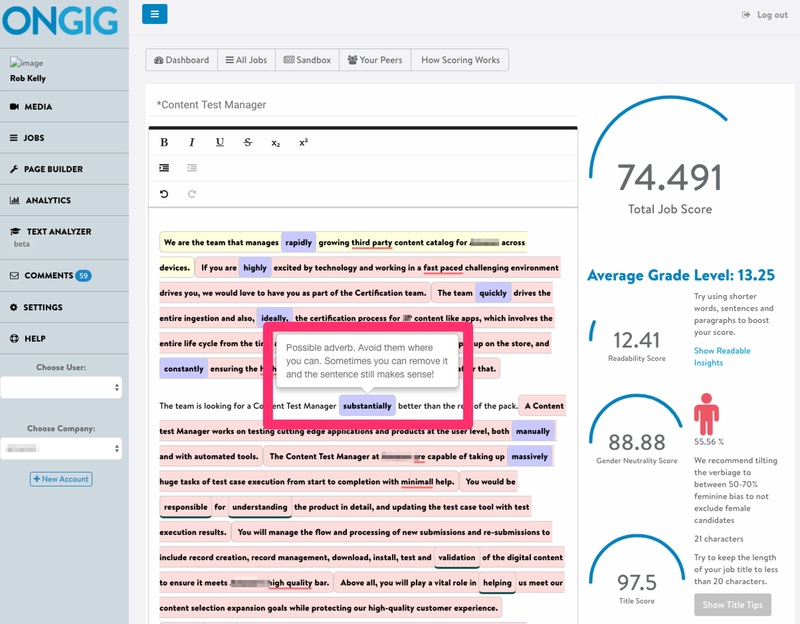 A text analyzer flags those sentences so that you can break them up and keep the reader engaged. Most job descriptions have words that are not needed. A couple of examples are “complex words” and adverbs. For example, this JD below uses the word “acquire”. Ongig’s Text Analyzer highlights “acquire” as a complex word because it has a synonym (“get”) that saves you 2 syllables. Did you know that many of the best candidates in the world suffer from a learning disability like dyslexia? Many of them get distracted after a couple of 3+ syllable words. I see job descriptions with dozens of such “complex words”. So reducing/deleting these “complex words” adds up! Save the candidate time and they’ll reward you with more attention! You can often delete an adverb from a sentence and the meaning is the same. And being brief/succinct is almost always to your advantage when writing job descriptions. 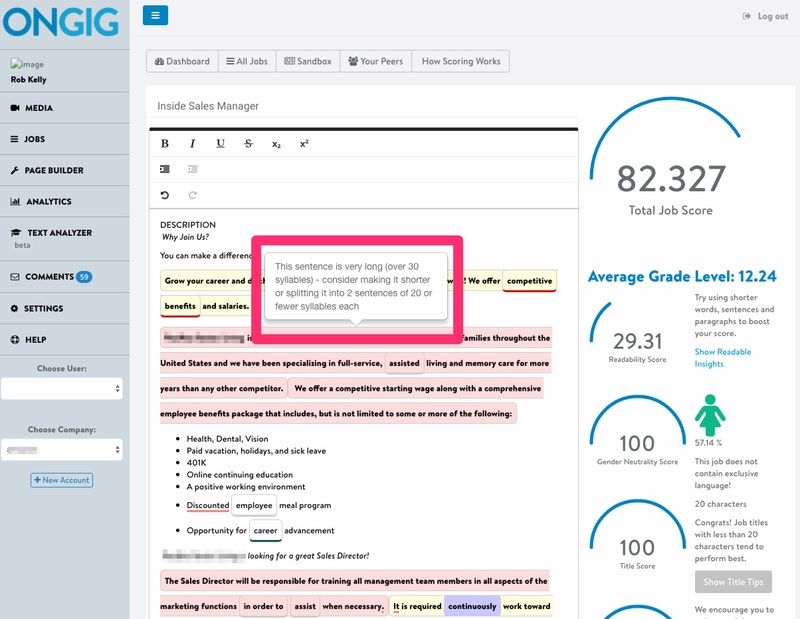 So, a good job description text analyzer highlights complex words and adverbs to let you choose to delete or change them. 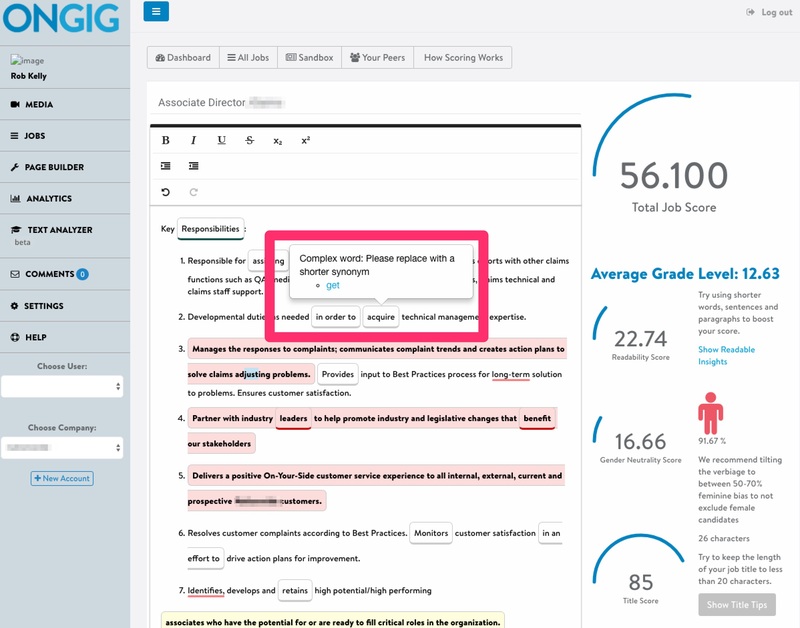 The best text analyzers give you live, inline recommendations on all this. There are some other unnecessary words/phrases (like passive voice) that I’ll cover in another post. 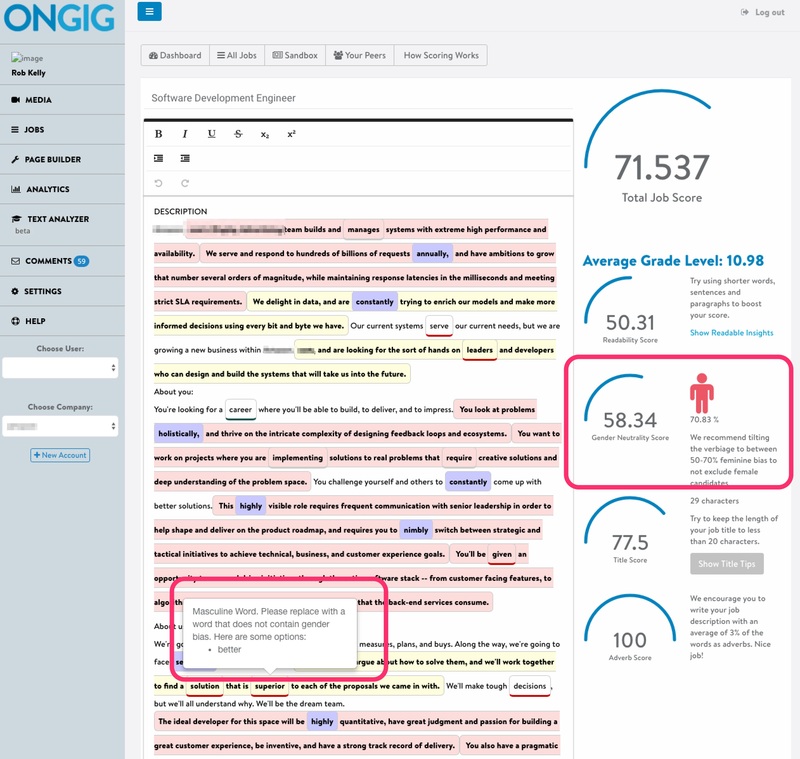 Ongig’s Job Content Marketing Cloud includes a Text Analyzer. We want you to see where you can tweak your job descriptions to make sure they are attractive to the best candidates possible.